WE'VE GOTTEN SOME GREAT QUESTIONS FROM OUR READERS AND HAVE DECIDED TO ADDRESS SOME OF THEM HERE, AS OFTEN AS WE FEEL INSPIRED TO, IN A QUESTION AND ANSWER POST. ONE OF OUR LOYAL FANS WANTED TO KNOW ABOUT THIS NOT-SO-NEWFANGLED THING CALLED A MICROSITE THAT SHE HAD SEEN FOR A WEDDING SHE ATTENDED. IT'S TRUE THAT LOTS OF COMPANIES ARE USING MICROSITES FOR VARIOUS REASONS. SO DO YOU NEED ONE FOR YOUR NEXT EVENT? WELL, THE ANSWER IS PROBABLY YES. WE KNOW, WE KNOW, YOU'RE JUST GETTING YOUR HEAD AROUND KEEPING YOUR CENTRAL COMPANY WEBSITE UP TO SPEED--WHAT'S THIS NOW? WE HAVE ALL THE ANSWERS YOU NEED AND WE'LL TRY TO KEEP IT AS SIMPLE AS POSSIBLE SO YOU CAN GET ON WITH MAKING YOUR EVENT THE BEST IT CAN BE. 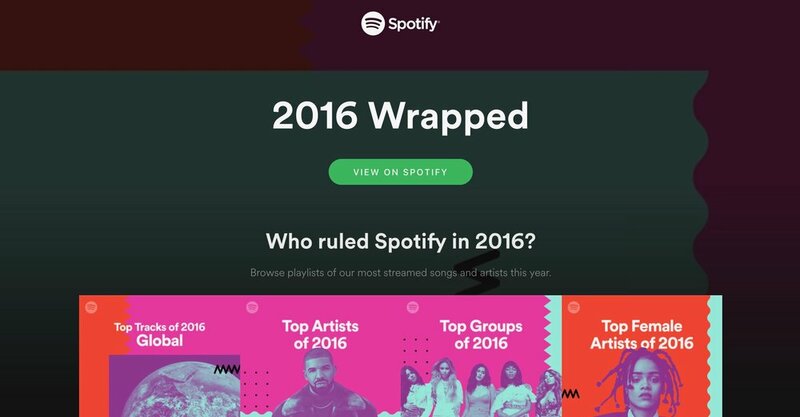 Spotify creates an annual microsite to highlight the best music of each year. Q: WHAT IS A MICROSITE? An example of an event microsite for one of Australia's most successful annual events. Each year the event has a new microsite. A: A microsite is a web page (or pages) connected to your brand, but separate from your main website. The URL can be connected to the main domain of your company (ex:microsite.yoururl.com) or you can purchase a separate domain name (ex: yourevent.com). It's up to you! Microsites serve different functions--read on to see if one of those purposes serves your needs. Q: WHY WOULD YOU NEED A MICROSITE? A: Companies are using microsites to target specific customers, to showcase a product launch, direct customers with a call-to-action, or for a time-limited promotional campaign. We think this is part of what makes microsites great for events--and why many events are using them now. They are cutting-edge, can be designed to have any necessary functionality, and they can last as long as you need them to, all without interrupting the flow of your main brand site. The other things we love about microsites: endlessly creative possibilities, a chance for urgency and buzz and to eliminate distraction from your central brand. Q: HOW DO I SET UP A MICROSITE? A: Much the same way that you would set up a regular website, there are many avenues depending on how much your budget can bear and how much you can or want to do yourself. There are basically three levels of service here: DIY, hired help, or full service. Each one has a cost scale and how much help you get will determine how much time you spend on the project yourself. Sites like Squarespace or Wix provide templates that will allow for a solo set up, or you can hire a consultant, graphic designer, or other technological support from sites like Fiverr, UpWork, Freelancer, or by personal referral to get your microsite up and running with some assistance. As with any website, there are also shops you can hire to handle the whole project for you from setup to design to launch. Aitom is a full-service, micro-site specific shop, and we also like Cygnis Media. A: Cost depends entirely on the scale and amount of assistance you receive in setting up the microsite. If you're creative or tech-y, you can probably get away with some serious cost-savings here. If not, you'll need to have help. The good news is that microsites are generally much smaller (hence the micro in the name) so don't require nearly as much work as a traditional website. However, the costs will increase as your need for functionality increases. For example, if you want your event microsite to handle everything from soup to nuts for your event, you're going to have to have all the information online plus an e-commerce component to handle ticketing and other sales aspects. Q: What content should I have on my microsite? A: For your event, that's really up to you and again, depends on your budget and the desired functionality of your site. If you're using it just for PR and marketing or for another single purpose, your content will probably be limited to a promotional video or other marketing content. If you want the event microsite to handle all of your event information, it should include everything: marketing materials, venue information, RSVP & ticketing, transportation / accommodations (if applicable), bios for headliners, entertainment or keynote speakers, schedules, panel topics, maps, and more--the whole nine yards! Q: What other considerations should I be aware of? A: For some brands, their microsites function as microbrands within the main company. For events, this can also be true, but more often, they are an extension of your company or brand and should function as such. The branding, design, and other visual aspects of your microsite should feel congruous with your home site, while at the same time feeling fresh and novel. They have to earn their keep, these microsites--serving the necessary functions for your event platform while also being beautiful to look at and meaningful to experience for the user. Q: What are some other ways I can use a microsite? The Java Jazz festival in Jakarta, Indonesia, is an annual music gathering featuring acts from across the world. Their microsite gets more sophisticated each year. If you have an annual event, you can create a foundation with a microsite structure once and then build on it for each successive event. The jazz festival recently added live streaming functionality to their site, allowing attendees to experience the festival from remote and far-flung locations. This is a great example of a creative way to broaden "attendance" and to increase revenue through digital participation. Q: What is the best example of a successful microsite? Even though it's funny, we're not actually joking. Elf Yourself is one of the most statistically successful microsites ever built. In 2006, business supply company Office Max was keen to set itself apart from competitors Staples and Office Depot. They built Elf Yourself as part of their holiday season advertising campaign. It is now a holiday tradition that has been going strong for 10 years. It succeeds because it's personal (you can upload your own photos of your family and friends), it's hilarious (dancing elves with your face?!) and it engages the participant. Even if you need something more tame or formal for your own event, consider how you can integrate these elements into your design and site structure--it's obviously a formula that works. The other successful element here is the creation of anticipation and urgency. The Elf Yourself microsite is only available for a limited time during the holidays, so there is a lot of anticipation for its annual open season. WHATEVER YOUR EVENT, WE HOPE YOU WILL CONSIDER HOW A MICROSITE MIGHT BE AN ASSET TO YOU. IF YOU HAVE OTHER QUESTIONS ABOUT MICROSITES THAT WE CAN HELP YOU ANSWER, OR IF YOU HAVE A QUESTION FOR OUR Q&A POSTS, PLEASE COMMENT BELOW AND WE WILL BE HAPPY TO ADDRESS THEM. IF YOU GO ELF YOURSELF, SEND US YOUR ELF GIFS AND WE WILL POST THEM ON OUR TWITTER FEED. HAPPY HOLIDAYS!